Talen Enegery installed eight Kardex Remstar Shuttle XPs to inventory warehouse parts, one to store gasket materials and one climate controlled unit to store circuit cards and circuit boards. The Susquehanna nuclear power plant, which is a Talen Energy generating facility located near Berwick, PA, is one of the largest nuclear power plants in the United States. The facility has two boiling water reactors with a combined capacity of more than 2,600 megawatts. Operating a nuclear power plant carries with it a special responsibility. “At Susquehanna every decision we make is safety-driven,” said Tom McAvoy, Logistic Services Supervisor responsible for warehouse operations at the Susquehanna plant. Safety is the overriding focus of the plant, and maintaining onsite inventory of parts and tools required for equipment maintenance is a top priority. The 56,000 square foot main warehouse onsite currently inventories over 58,000 active SKUs needed for mandatory preventative maintenance work and scheduled shutdown maintenance. With inventory expanding yearly and the main warehouse nearing capacity, Susquehanna recently replaced approximately 5,000 square feet of shelving storing small parts with 8 Shuttle Vertical Lift Modules (VLMs) freeing up roughly 4,100 square feet of floor space – a 82% savings. With the original 8 Shuttle XPs a proven solution, a ninth Shuttle XP was purchased to store gasket materials and address a potential safety issue for Logistic Services employees. Further, if gaskets remained in inventory for an extended period of time, they could become dirty, deformed, and unusable upon retrieval. Using a Shuttle XP with an oversized tray size, much of the gasket inventory was moved to an enclosed environment ensuring clean and usable gaskets while providing employees easy ergonomic access. A tenth climate controlled Shuttle XP was added to store circuit cards and circuit boards in accordance with the Electric Power Research Institute standards. These circuit cards and circuit boards were previously stored on bin shelving and subject to changing environmental conditions within the warehouse. “A temperature and humidity controlled environment is a good solution for our storage of circuit cards and circuit boards” said McAvoy. Inventory accuracy can also cause major maintenance headaches. To prevent this, the ERP system selects a random number of parts to cycle count per day based on an inventory cycle-count requirement. The VLMs also provide a higher level of secured access, allowing only warehouse employees access to the machines. “Cycle counting combined with the secured storage environment has allowed us to achieve an inventory accuracy greater than 99%,” said McAvoy. Continually counting a few parts per day reduces the risk of parts not being available when required. The main warehouse at Susquehanna supports the mandatory maintenance schedule by supplying the right parts in a usable condition and on time. The main warehouse receives two types of work orders – preventative maintenance work orders and planned scheduled shut down work orders. The NIMS (Nuclear Information Management system) automatically generates preventative maintenance work orders based on the mandatory schedule. Each work order is sent to the main warehouse for fulfillment with a need date attached to it. Upon receiving a work order, the warehouse associate references the storage location on the work order to locate the correct VLM and uses the controller keypad to enter the tray number. The VLM moves to retrieve the tray that contains the part delivering it directly to the operator at an ergonomic waist height. 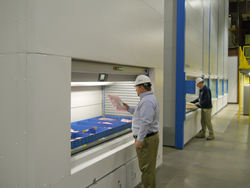 This eliminates the walk and search time commonly associated with storage bins and shelving. The worker picks the part from the tray, and moves to the next tray to collect the next part required for the work order. When all parts required for the work order have been picked, the work order is stored as a completed work order in one of the 10 VLMs. The main warehouse fulfills preventative maintenance work orders several weeks in advance, allowing time to procure any parts required that are not onsite. When workers arrive to perform preventative maintenance work, they simply stop at the material issue window to collect the work order containing the required parts. The main warehouse easily retrieves the completed order stored within the VLM and the workers are quickly on their way to perform the maintenance required. Refueling a nuclear reactor also requires Susquehanna to schedule a complete shutdown every two years. This scheduled shutdown requires about 1,200 additional contracted workers to come on site to perform hundreds of maintenance tasks. Scheduled shutdown work orders are picked just like preventative maintenance work orders, but on a bigger scale as these scheduled maintenance outages require 6,000 to 8,000 parts. “Organized, accessible and accurate parts inventory is critical in our industry and the Shuttle VLMs have supported our ability to create a reliable parts management system,” said McAvoy.